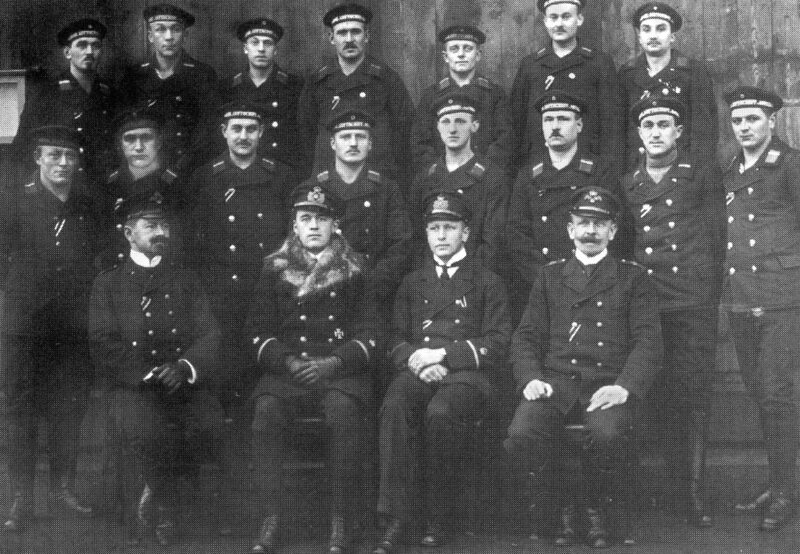 Oberleutnant zur See Werner Peterson was in command of the naval airship L16 when Evenwood was bombed 5/6th April 1916. He was killed about 6 months later 24 September 1916, when shot down over Essex whilst commanding the airship L32. He is buried in Cannock Chase German Military Cemetery, Staffordshire. From December 1914 onwards, Zeppelins crossed the North Sea to hit targets in northern England. For instance 15 June 1915 Wallsend marine engineering works, Cookson’s antimony works and Pachin’s chemical works at Willington Quay, Palmer’s engine construction department at Jarrow and collieries in the vicinity of South Shields were bombed causing damage and many casualties and to the south of the region, 8 September 1915 Skinningrove iron works in North Yorkshire was hit. The official history states that such attacks caused considerable disruption to industrial output and interrupted vital war work as trains were stopped and blast furnaces were dowsed. For example, during 1916, 13 weeks of Zeppelin alarms caused a loss of 390,000 tons of pig iron which represented about 1/6th of total annual output. Such raids forced the diversion of considerable resources to the defence of the country and possibly as important, there was a detrimental effect on public morale. On the night of 5 & 6 April 1916, the war came to communities of south west Durham when there was indiscriminate bombing of Evenwood/Ramshaw and Eldon Lane by the German Zeppelin L16. 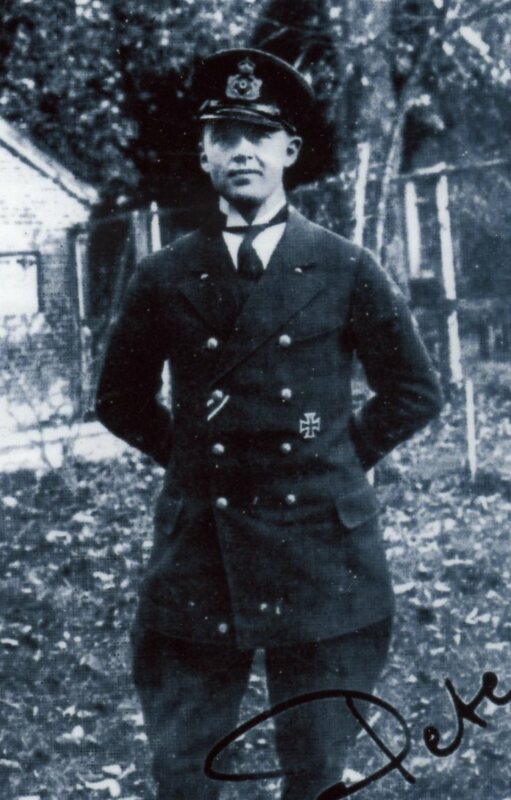 On Wednesday, 5 April 1916, the naval airship L16 under the command of Oberleutnant zur See Werner Peterson left its base at Nordholz in North West Germany heading for northern England. The mission was a night attack on Leeds. 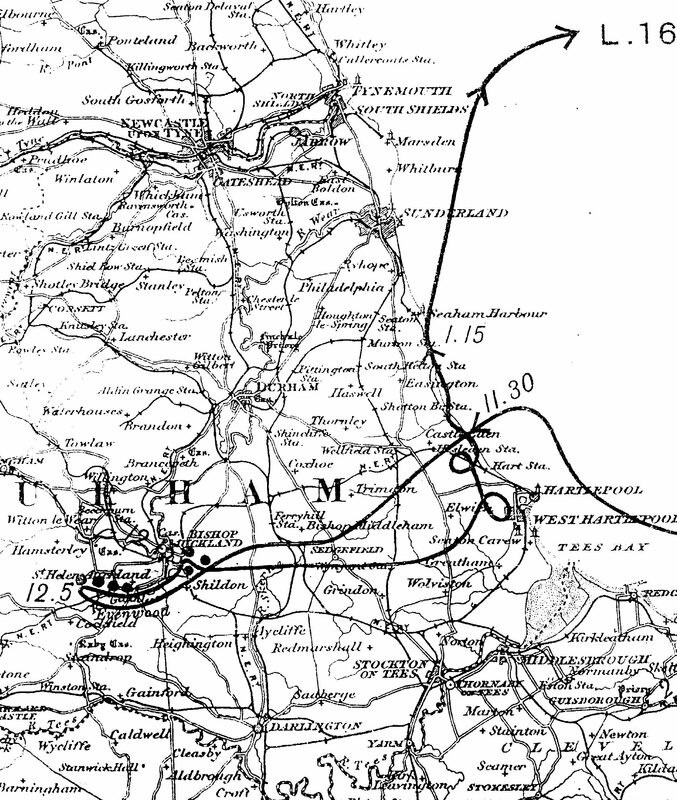 Peterson intended to cross the English coast over Scarborough then cruise westwards to bomb Leeds. At about 11.30pm, on the night of the 5th April, the L16 actually crossed the English coast to the north of Hartlepool, well to the north of Scarborough. It then headed inland towards the coal mining area around Bishop Auckland. Probably deceived by the fiery glow of pit heaps and coke works together with the smoke from the numerous collieries around the Bishop Auckland area, Peterson probably believed that he was over Leeds, Passing Evenwood Gate at 11.50pm, the zeppelin turned northwards towards Evenwood and Ramshaw. At 12.03am, bombs were dropped over targets near Railey Fell colliery and Evenwood. The last fell at 12.09am at Evenwood Gate. In the 19 minutes L16 roamed above the area, 13 high explosive and 10 incendiary bombs were dropped from an altitude of an estimated 5000ft. It was reported that 2 houses were wrecked, 6 seriously damaged, Ramshaw School and several other dwellings suffered damage. Casualties were light, only one man and a child were injured. The L16 turned for home dropping another 27 bombs on the Dene Valley area, to the east of Bishop Auckland where there was another concentration of collieries and coke works at Auckland Park and Eldon. Eldon Lane School, buildings in Gibson Street at Close House, the Co-op, the Friends’ Meeting House and several other houses were damaged. Tragically, one child 9 year old Robert Moyle was killed when 21 Halls Row, Eldon was hit by an incendiary bomb. At the time newspaper reports were censured and could not carry the name of the dead boy. His father William was serving in the Army in France. Robert’s funeral was held at St. Mark’s Church, Eldon and he was buried in the churchyard. The airship headed for the coast, flew north eastwards over Seaham Harbour at about 01.15 and escaped the attention of 5 defence sorties. Aircraft were despatched from Cramlington, Beverley and Scarborough but failed to spot the L16. One R.F.C. pilot Captain J. Nichol crashed his plane into a house and was killed outright. The Commonwealth War Graves Commission confirms that Captain John Nichol of the Royal Flying Corps (secondary regiment 1st Battalion, Royal Scots Fusiliers) aged 22 was killed 5 April 1916. He was the son of Dr. F.E. and A. L. Nichol, of 1 Ethelbert Crescent, Margate, Kent. He is buried in Margate Cemetery alongside his brother Edward who also died on active service. Destroyers from the Tyne and the Humber also drew a blank in their search for the zeppelin. Back in Evenwood and Ramshaw, it is reported that many children spent the night in the open air in the fields and most were absent from school the following day. Local tales inform us that many spent subsequent nights sheltering in “Snecker’s Drift”, a small coal drift located in the pit field just to the southwest of the road bridge over the river Gaunless. In the neighbouring village of Cockfield, many children were out all night owing to the visit of the Zeppelin and although no bombs were dropped on the village the noise of them exploding at Evenwood was clearly audible. The children were upset and tired on the 6th but were reportedly much calmer on the following day, the 7th. Ramshaw School was closed for 2 weeks for repair works but when it opened not all the windows had been replaced and the weather was extremely cold – only 50% of the roll was present. 7 April: The War Office statement appeared in “The Times” and this confirmed the attack of 3 Zeppelins – the first dropped 5 bombs and there were no casualties, the second dropped no bombs and the third dropped several bombs causing only slight material damage. 24 explosive bombs and 24 incendiary bombs had been dropped causing injury to 2 men, 1 woman and 5 children. One child had been killed. “Naval Airships on the night of April 5 destroyed large ironworks near Whitby and extensive buildings with blast furnaces after previously pelting with explosive bombs and placing out of action a battery north of Hull. 19 October 1917: The L16 airship was wrecked when landing at Nordholz. It made a total of 132 flights of which 16 were raids. Many of the flights were under the command of Oberleutnant zur See Peterson. As the war progressed, the both German Navy and Army built their own airship fleets. The navy airships were usually made of aluminium by the Zeppelin Company and the army used the wooden Shutte-Lanz or “SL” airships. By 1916, there were 2 generations of German airship employed in combat and both forces operated bombing missions over England. In the summer of 1916, the new L30 class airships were delivered to the German Navy. The Leader of Airships, Peter Strasser orchestrated an all-out offensive against England for late summer. Ineffective raids took place on the 31 July, 2, 18 & 24 August but the mission of 2 September was the largest zeppelin raid of the war. London was the target. The raiding fleet consisted of 16 airships, 12 naval (L11, L13, L14, L16, L17, L21, L22, L23, L24, L30, L32 & SL8) and 4 army (LZ90, LZ97, LZ98 & SL11). SL11 was attacked by 2 aircraft and shot down and the crew was afforded a discrete military funeral since such attacks on civilian populations were roundly condemned by the press and public feeling ran high. 23 September 1916: Oberleutnant zur See Werner Peterson took part in another attack when he commanded the L32 on a raid over southern England. The L32 circled over the River Thames, possibly with engine trouble. He was cruising with L31. The cloud cover above the Thames broke and the L32 was spotted immediately by searchlights from London’s eastern defences and attacked by anti-aircraft fire. Peterson dropped his payload near Purfleet, Essex and turned towards the sea heading for home and trying to gain altitude. RFC First Lieutenant Frederick Sowery, aged 23, flying his British built BE2c4112 biplane was on routine night patrol and sometime after 1.00am intercepted L32. He fired 2 drums of Brock-Pomeroy ammunition (note elsewhere quoted as “firing three drums of incendiary ammunition into the body of the airship.”) L32 soon caught fire and with her hydrogen blowing off like a blow torch, she dropped slowly to the ground near Snail’s Hall Farm, South Green, Great Burstead near Billericay, killing all 22 crew on board. Officers from the Naval Intelligence Division were first to the scene and despite the heat, filtered through the wreckage. They were rewarded with a copy of the German Navy Cipher Book which Peterson must have taken on board against regulations. Its capture was a boon to Royal Navy code breakers. One witness described how in the night sky he saw a pink glare which turned to coppery red, then a ball of flame emerged which changed its shape to a perpendicular cylindrical mass of flame. By 3 o’clock that night, not only had the local people rushed to see the wreckage but cars full of Londoners started to arrive to view the wreckage of twisted and broken aluminium struts. Access to the area was limited by a narrow country lane and by 8 o’clock it was reported that the lane was blocked with “motor cars, motor-cycles, bicycles, traps, tradesmen’s carts, and pedestrians, all jammed together”. By far the most popular transport was bicycles with hundreds laid abandoned on the fields. Souvenir hunting was prevented by a cordon of soldiers armed with fixed bayonets, and police, but this did not deter the souvenir hunters who scoured nearby potato fields looking for debris. Even lemonade sellers set up their stalls in an attempt to profit on the spectacle. First Lieutenant F. Sowrey was later awarded the DSO. 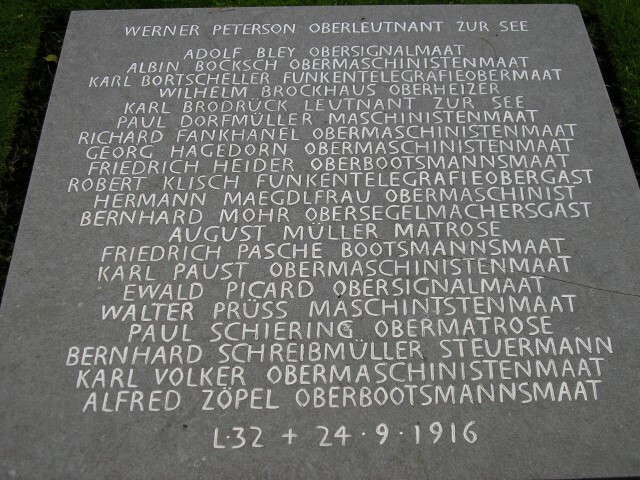 A few days later Oberleutnant zur See Werner Peterson and his crew were buried at Great Burstead Churchyard. The next raid took place 1 October – L31 was commanded by Heinrich Mathy who made an audacious attack on Portsmouth but on his return his vessel was hit by gunfire from an aeroplane flown by Second Lieutenant W.J. Tempest. The zeppelin came down at Potter’s Bar, killing all crew members. In total 11 airships took part in this raid but only 2 managed an attack. The loss of 3 ships, L31, L32 and L33 was a serious blow and 2 experienced officers including their L3O class leader Heinrich Mathy. Captain Alois Bocker had been captured. Captain Ganzel was dismissed – his nerves were wrecked. Many crew members were dead or captured. This had a major debilitating effect on German morale. There is no record of a Zeppelin raid on Hartlepool for that date. However, a week earlier 28 November 1916, the German airship L34 was intercepted and destroyed by British pilot Second Lieutenant Ian Pyott in his BE2c2738 off the coast of Hartlepool. Pyott was so close that his face was scorched. This must be the incident to which Rev. Collis referred. In 1916, there were 23 airship raids in which 125 tons of ordnance were dropped killing 293 people and injuring 691. Anti-aircraft defences were becoming tougher and new zeppelins were introduced which increased their operating altitude from 1,800m to 3,750m (6,000 ft. to 12,375 ft.) Throughout 1916 anti-aircraft equipment improved and strategies were developed to combat the threat from the airships. In view of the mounting losses, Germany turned to other technologies particularly the development of the Gotha, a large plane specifically designed for bombing to replace the airships. The naval airship division was slowly relegated to the status of reconnaissance arm of the fleet. The threat of the zeppelin was over. The Leader of Airships, Peter Strasser continued his push for their use throughout the war but he was killed 5 August 1918 while leading the last zeppelin raid. A total of 84 Zeppelins were built during the war. Over 60 were lost, roughly evenly divided between accident and enemy action. 51 raids were undertaken in which 5,806 bombs were dropped, killing 557 people and injuring 1,358. It has been argued that the raids were effective far beyond material damage in diverting 12 fighter squadrons and over 10,000 personnel to air defences and hampering wartime production. The German Military Cemetery was established in 1959 and contains 2,143 war dead from the Great War including the crews of 4 zeppelins shot down over England. Their remains were brought from their original burial places at Potters Bar, Great Burstead and Therberton. Oberleutnant zur See Werner Peterson and the crew of L32 are laid to rest here.